Grease a 12-cup Bundt pan, or spray with nonstick cooking spray. Sprinkle nuts evenly over bottom; set aside. Combine cake mix, pumpkin, sour cream, eggs, pumpkin-pie spice and rum extract in a large mixing bowl; beat on low with an electric mixer until blended. Increase speed to high and beat 2 minutes, or until light and fluffy. Pour batter into prepared pan. Bake at 350°F for 35 to 45 minutes, or until a wooden pick inserted into center of cake comes out clean. Meanwhile, prepare Rum Butter Glaze. Allow cake to cool in pan 10 minutes. Poke holes into cake (while still in pan) with a long pick. 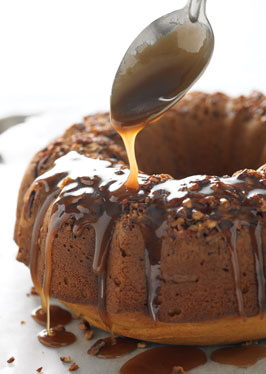 Pour half of Rum Butter Glaze over cake; let stand 5 minutes, then invert cake onto serving plate. Poke additional holes on top of cake with pick; pour remaining Rum Butter Glaze over cake. Cool. Combine ½ cup Darigold butter, ½ cup sugar and ¼ cup water in a heavy saucepan; bring to a boil over medium-high heat and cook, stirring constantly, until golden (about 1 minute). Remove from heat and add ½ cup rum. * Cool to warm before pouring over cake. *1 teaspoon rum extract and ½ cup water may be substituted for rum.